Let’s look at the four-hour chart. Tenkan-sen line is below Kijun-sen, both lines are horizontal. Chinkou Span line wasn’t able to cross the price chart from below and is moving along it. 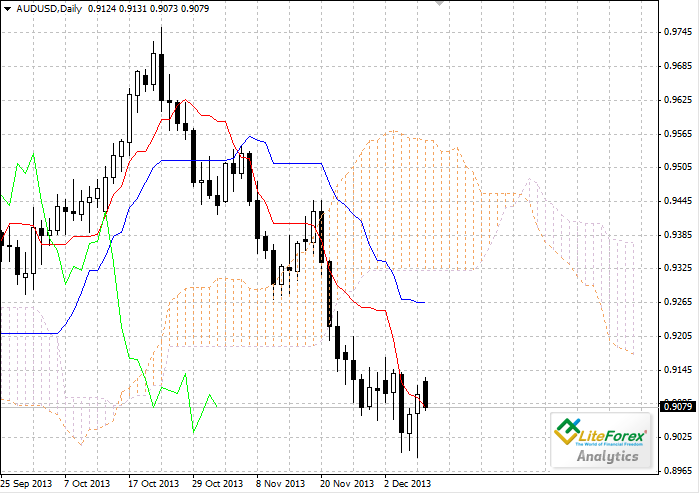 Current cloud is descending, bit its width is only 15 pips. 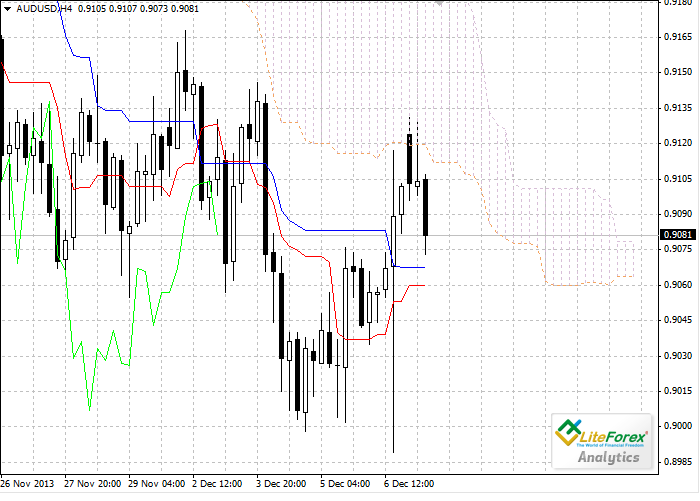 The pair has broken through the levels of Tenkan-sen and Kijun-sen lines, the latter becomes a support level at 0.9067; however AUD/USD couldn’t enter the cloud. Senkou Span A line is the closest resistance level at 0.9112. On the daily chart Tenkan-sen line is also below Kijun-sen, the red line is directed downwards, while the blue one is moving sideways. Chinkou Span line is below the price chart from below; current cloud is descending. The price has broken through the cloud and is still falling. The closest resistance level is Kijun-sen line at 0.9265. One of the previous minimums of Chinkou Span line is expected to be a support level at 0.9033. On the four-hour chart the signal to buy will appear after the cross of Tenkan-sen and Kijun-sen lines or the cross of Chinkou Span line and the price chart. On the daily chart Bearish movement is still quite strong.